Warehouse Whooping – In the latest Diary of a Newbie, Shaun Taylor heads indoors to fl y his Blade Inductrix and gets some friends to join him, ending up in the ubiquitous race at the end of the evening! Through the Lens – The Torrent 110 from Blade can be used indoors and out as demonstrated here as our test pilot takes in some fresh air with the new brushless equipped micro. DJI Inspire 2 – DJI’s Inspire 2 is a professional-level video and camera drone that aims to be an essential part of the filmmaker’s armoury. Tom Stacey gets up close and personal with Hollywood’s latest must-have. Nikko Drones – The Air Elite 115 and Race Vision 220 FPV Pro are two new drone models from toy manufacturer Nikko. Don’t stop reading though just because we mentioned the word ‘toy’ though as these Nikko models really are the real deal! Insta360 Nano – Perfect for action sports or sight seeing as well as many other applications, this easy to use camera adds another dimension to what’s possible from your smartphone. Yuneec UAV Pilot – David Bright from Bright Sky Videos checks out the updated version of Yuneec’s UAV Pilot flight simulator that now caters for the Typhoon H.
FrSky Taranis Q X7 – The new radio from FrSky that aims to offer all the goodness off the X9D+ at a more wallet-friendly price – enter the Taranis Q X7. 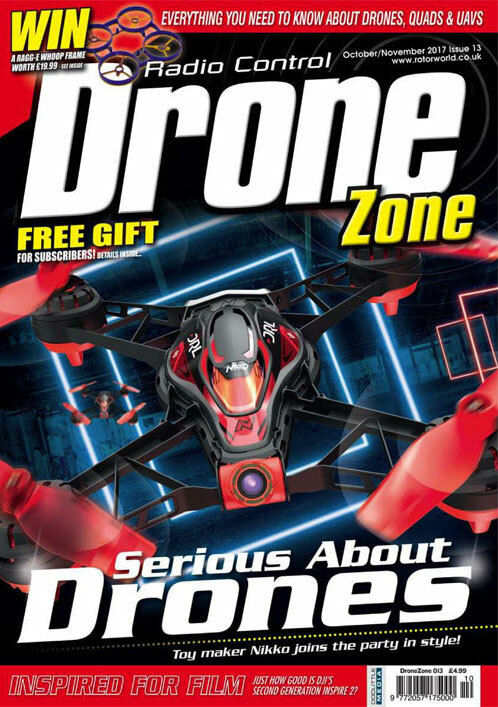 Blade Torrent 110 – The Torrent 110 is Blade’s new micro drone that features brushless motors and the capability to be flown on 3S for greater performance indoors and out.